Make memories to last a lifetime. Leave bustling Buenos Aires and spend two relaxing days at sea prior to anchoring in unhurried Puerto Madryn. 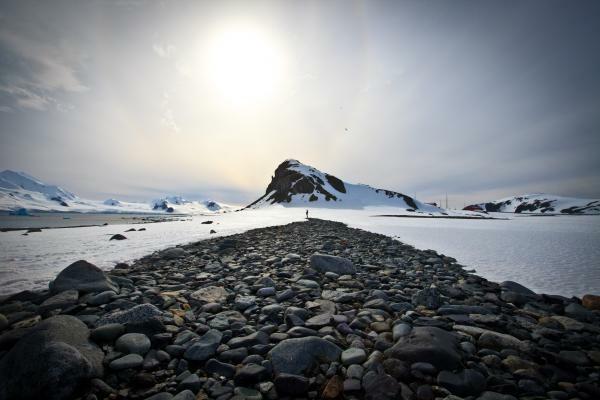 Anticipate rockhopper penguin and black-browed albatross watching on West Point Island as you prepare for the transformative experience of witnessing the massive glaciers and ice floes of the Antarctic. Embark Silver Cloud in Buenos Aires and meet some of your fellow explorers as you become acquainted with the luxurious amenities found on board. A mandatory safety drill takes place before you set sail. During the afternoon be introduced to your Expedition Team and important members of the crew. At sail-away say goodbye to the Capital of Tango –Tango is recognized as an Intangible Heritage by UNESCO. Take the opportunity to relax after your long flight to join Silver Cloud in Buenos Aires and have a leisurely breakfast before you join one of the talks by the Expedition Team members. These talks cover a wide range of subjects – from geology to history, biology, and even botany (to be seen in the Falkland Islands). Also be invited to attend a special Welcome Aboard cocktail party hosted by the Captain, who introduces his senior officers and various members of the crew. Puerto Madryn is the starting point for two different excursions: a full-day tour to the Valdes Peninsula (a UNESCO World Heritage Site) to see southern right whales, penguins, and seals or an extended half-day tour to see one of the most accessible fossil sites in Argentina. To reach the Valdes Peninsula and its attractions one has to travel close to 100 kilometers by bus. Sea lions, fur seals, and elephant seals are found along the shore of the peninsula, as well as orcas. Southern right whales can be found in the two bays adjacent to the peninsula. A museum and interpretive center introduces you to the terrestrial and aquatic fauna of Patagonia and permits a view of both gulfs (Golfo Nuevo and Golfo San Jose) from a watchtower at the narrowest part of the isthmus connecting Valdes Peninsula with the mainland. A site of global significance for the conservation of marine mammals, the peninsula is one of the highlights of this voyage. If you are more interested in the evolution of animals and fossils, the Museo Paleontologico Egidio Feruglio and the Paleontological Park Bryn Gwyn (some 70 kilometers south of Puerto Madryn) can be to your liking. Both the museum and the park have an outstanding collection of fossils from the last 40 million years and show the evolution of life in this part of Patagonia. Taking advantage of the day at sea, the Expedition Team presents talks about the Falkland Islands (Malvinas, as the Spanish-speaking world calls them) that prepares you for the exciting adventures ahead. Birders out on deck want to keep an eye out for black-browed albatross, southern giant petrels, and Cape petrels. Today you have two opportunities to enjoy the remarkable beauty of the remote Falkland Islands. During the morning visit New Island, a wildlife and nature reserve. The New Island Conservation Trust, a private environmental conservation group, protects its many birds and animals. The Zodiacs take you ashore near the island’s small settlement at Coffin Harbour. From there hike past the Barnard Memorial Museum crossing the island from east to west to reach the rocky cliffs and a rookery where rockhopper penguins and blue-eyed shags share the same nesting area. Also observe black-browed albatross going about their daily routines and perhaps even spot upland geese on your hike. The on-board historian might tell you about ‘Barnard’s barn’ — a stone structure once belonging to an early settler and now a museum, as well as the wreck of Protector III — an old minesweeper used for seal hunting, now grounded just off the shore not too far from your landing site. During lunch sail in a northeasterly direction to West Point Island. Peale’s dolphins and Commerson’s dolphins with their distinctive black and white markings can often be spotted as one approaches West Point Island. The Zodiacs take you to a jetty from where you walk slightly less than 2 miles to Devil’s Nose. Walking across rolling moorland and past gorse be observed by grass wrens, long-tailed meadowlarks, Falkland thrushes, striated caracaras and turkey vultures, but your goal is to reach colonies of black-browed albatross that nest side-by-side with rockhopper penguins. The winds at Devil’s Nose are usually so strong that the albatross only have to spread their wings to take off, while the penguins (as their name implies) have to hop from rock to rock to reach either the shore or their nests. Once back at the farm, the hospitable island owners invite you to have tea, coffee, and homemade cakes and cookies and are always happy to answer your questions and share their stories. Stanley is the capital of the remote Falkland Islands, and, although Argentine authorities have repeatedly claimed the islands as part of their country, it has a distinct British ambience. A reminder of the 1982 Falkland War between Britain and Argentina is the War Memorial. Opt to take a ‘city tour’ by bus with a local guide or stroll through the charming streets of this colorful little town, lined with quaint cottages and a variety of traditional pubs. Visit the 19th-century Anglican cathedral (the southernmost Anglican cathedral in the world) and wander through the Falkland Islands Dockyard Museum. For stamp collectors a visit to the Philatelic Bureau is a must. Depending on local conditions there might be the chance to see gentoo, Magellanic, or king penguins at Bluff Cove or Volunteer Point. Leaving the Falkland Islands behind, head for the South Shetland Islands and Antarctica. The day at sea can be used to present further lectures. As you are heading for Elephant Island, an on-board Historian might talk about Shackleton’s Endurance expedition and the crew members awaiting their rescue at Point Wild, while the Marine Biologist and Ornithologist cover the wildlife to be seen. As part of the preparation to visit Antarctica, briefings regarding correct procedures when going ashore and a thorough inspection of clothing and outdoors gear takes place. Participate in other on-board activities or peruse an array of titles and topics in the well-stocked Library. Take a stroll on deck and enjoy the solitude and splendor of the vast sea and sky. Awesome glaciers and steep cliffs greet you as you approach Elephant Island, so named for its former abundance of elephant seals. The island is home to several chinstrap penguin rookeries, Antarctic fur seals, and elephant seals as well as old moss colonies. Weddell seals and macaroni penguins can also be found here. When Sir Ernest Shackleton’s ship Endurance was crushed in pack ice in the Weddell Sea in late 1915, the crew was eventually stranded on the island for 135 days. A solitary bronze bust can be seen at Point Wild, honoring the Chilean pilot Luis Pardo, who took the cutter Yelcho across the Drake Passage to rescue Shackleton’s men. While sailing along the Antarctic Peninsula, every turn can reveal a new and breathtaking adventure. The pack ice becomes thicker the closer you move into Antarctica’s vast white wilderness. Remote and otherworldly, Antarctica is irresistible for its spectacular iceberg sculptures and calving glaciers, and for the possibility of close encounters with marine mammals. As late spring is the beginning of the Antarctic season, Silver Cloud takes you to seemingly untouched and never before visited sites. Watch for seals sunbathing on slow-moving ice floes and for humpback, minke, and orca whales to surface from below the frigid waters. 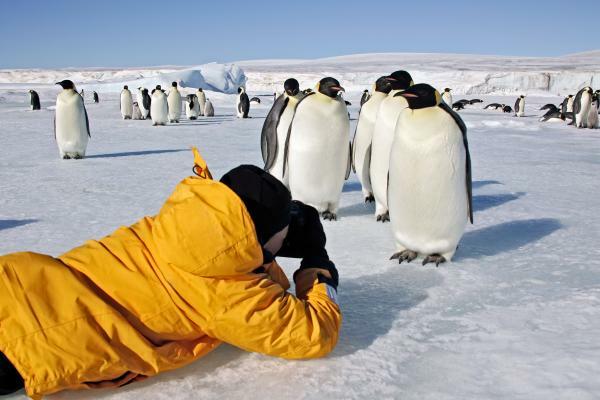 Each day attempt Zodiac departures, and, if conditions permit, cruise amidst colorful icebergs or step ashore to visit a variety of penguin rookeries and perhaps scientific research stations on complimentary excursions led by your team of natural history experts. Antarctic Sound: Named after Nordenskjöld’s ship, this 30-mile-long stretch of water at the north end of the Antarctic Peninsula offers some of the best tabular iceberg observations. Brown Bluff, Tabarin Peninsula (a 2,225-foot bluff on the Antarctic continent): Brown Bluff is an ice-capped, 745-meter-high, flat-topped mountain with a prominent cliff of reddish-brown volcanic rock. Adelie and gentoo penguins, kelp gulls, and Cape petrels use this as a breeding area. Birds such as the all-white snow petrel and skuas may be seen from a distance. As you explore the area, Weddell seals may be seen basking in the sunlight. 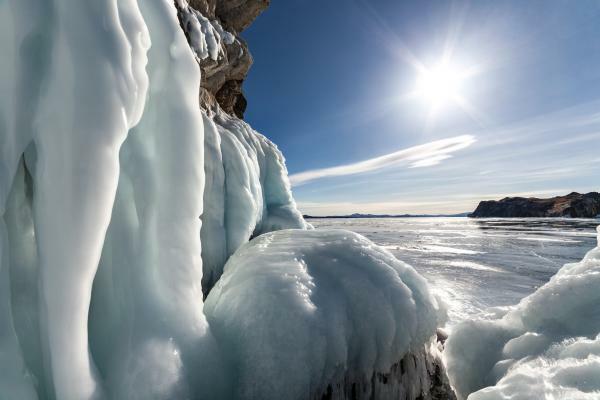 If conditions permit, a hike onto a nearby glacier might be possible. Cuverville Island, Errera Channel: The island was discovered during de Gerlache’s Belgica expedition of 1897–99, and was named for a vice-admiral in the French navy. The large, bare rock areas near the shore provide nesting sites for gentoo penguins, but the penguins also look for exposed rocks on the slopes. Snow petrels and Pintado petrels may be seen, and Wilson’s storm petrels nest in the higher scree of the island. Depending on conditions a hike towards the top of the island for stunning panoramic views might be offered. 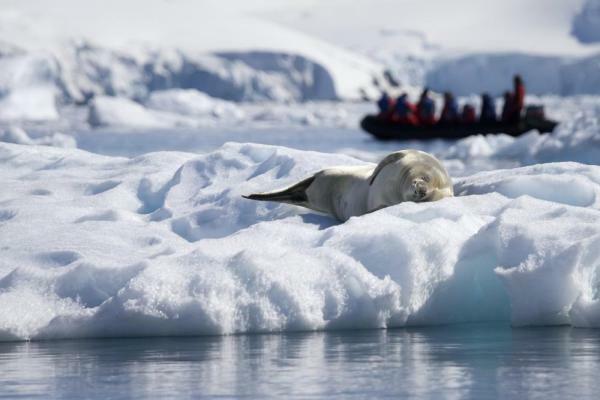 During Zodiac tours, hope to see hauled-out Weddell seals. Paradise Bay (on the Antarctic Peninsula): The bay is well named for its spectacular scenery of mountains, glaciers, and icebergs. From the ship, observe Argentina’s “Base Almirante Brown”, one of many Antarctic research stations. Here, you can actually set foot on the continent of Antarctica. Close to the station gentoo penguins, blue-eyed shags, Antarctic terns, kelp gulls, and skuas have all been seen nesting. Depending on the conditions you can view the wildlife from sea level while cruising in Zodiacs or cruise the bay with Silver Cloud. There’s a good chance you come across a crabeater seal relaxing on a nearby ice floe, or, if you’re very lucky, your Zodiac driver may locate a minke whale. Neko Harbor: The site is named after a whale factory ship, which often used this bay, and Neko Harbor still today offers good chances to see whales. A landing provides an opportunity to see gentoo penguin rookeries and quite possibly Weddell seals and crabeater seals hauled out on the cobble beach. A hike to a lookout point is a good exercise and is rewarded with panoramic views of the glacier, Andvord Bay, and the Gerlache Strait. Port Lockroy, Goudier Island: The British built a listening station on Goudier Island during WWII, which was then used as a research station in the 1950s. Bransfield House was restored in 1996 and since then has acted as a museum and gift shop. The Antarctic Heritage Trust operates a post office at the station, which is open during summer. Snowy sheathbills and gentoo penguins roam outside the museum and leopard seals often patrol the sea. Port Foster, Whalers Bay (Deception Island): Deception Island is an excellent example of a caldera where it is believed that the volcano’s summit collapsed with one section sinking far enough to allow the sea to flood the interior. Sail into the caldera through a narrow entrance called Neptune’s Bellows and anchor in sight of the former whaling station and the former British Antarctic Survey station. The resident geologist takes the opportunity to explain the unique volcanic features of the area and their importance for science, while your historian might introduce you to the whaling history of Deception Island. Still visible on the island are the boilers used to make whale oil in the early 1900s. Conditions permitting, you might hike to Neptune’s Window for spectacular panoramic views. The Drake Passage has a notorious reputation for its turbulent seas due to the funnelling effect of the mountain ridges and seafloor pushing winds and water eastwards. When Silver Cloud reaches the Antarctic Convergence, a fluid and fluctuating natural boundary where cold polar waters from the south meet warmer water moving southward, there is another good chance to see whales and seabirds as nutrients are pushed to the surface by the different currents. Spend some time on deck watching black-browed albatross, southern giant petrels, southern fulmars, Cape petrels and other seabirds gliding in the air currents of the ship's wake. There are some opportunities to attend additional presentations offered by the Expedition Team lecturers, to edit the countless photos taken, and to socialize with new friends as you travel north towards Ushuaia.